Screen goddess, Stephanie Okereke, has cited infidelity and treachery, among other vices as the reason she is seeking the dissolution of her four-year marriage to former Super Eagles player, Chikelue Iloenyosi. The Nollywood star got married to the ex- Super Eagles player in Lagos on August 31, 2004, but according to her, even at the time of their wedding, Iloenyosi was already married to one Ijeoma Mba in the United States without her knowledge. 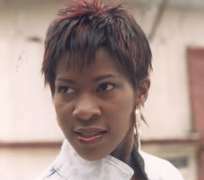 Okereke packed out of her matrimonial home on January 14, 2007 after she was reportedly confronted by her husband's first wife and other women with whom he was allegedly having illicit affairs. A divorce petition brought by Okereke's counsel, Robert Bob Okoroji, is now before a Lagos High Court. In the petition, the actress says said she was fed up living with lies, even as she claimed she was deceived into the marriage. The petition said: “Prior to August 31, 2004, when marriage sought to be nullified was entered into by the respondent and the petitioner, the respondent, unknown to the petitioner, had gotten married to one Ijeoma Mba. Besides seeking for a court order terminating the marriage, Okereke is also praying the court to award a sum of N100 million damages in her favour against Iloenyosi for the trauma he allegedly subjected her to. However, the husband, in his response, put a lie to the claim that the marriage was void in law as at the time it was contracted on August 31, 2004. He said he was already a bonafide divorcee, having quit his wedlock with the said Mba two years earlier before his marriage to Okereke. The respondent insisted that he was a bachelor in August 2004 when his marriage with the actress was consummated as he had dissolved his marriage with Mba since 2002. Apart from the allegation of infidelity and counter-claim of infidelity between the petitioner and the respondent, there are also claims and counter-claims of ownership of multi-million naira property. Specifically, the petitioner claimed that while they were married, she bore the financial burden of sustaining the family as the man could not offer any meaningful contribution but depended on her earnings from acting and other businesses. Her petition reads: “Cohabitation between the petitioner and the respondent ceased on January 14, 2007 after the petitioner was confronted by the first wife of the respondent, namely Ijeoma Mba, and so many other women with whom the respondent was still having illicit affairs. “When the petitioner confronted the respondent about his said earlier marriage with the said Ijeoma Mba, the respondent did not deny but he became violent and physically assaulted the petitioner. In his response, the former soccer star countered that there was no time his first wife or any other woman ever confronted the petitioner, especially as he never set eyes on Mba since 2002 after the dissolution of their marriage in the US. He accused Okereke of hiring thugs to invade their home and cart away his property to counter the allegation that he fraudulently obtained huge sums of money from his wife. Part of the money alleged to have been fraudulently obtained by the husband was a sum of N4.3 million allegedly meant for the purchase of land for his brother-in-law. However, Iloenyosi insisted that the money belonged to him, claiming it was repayment of debt owed him by one Jimmy. Among the property that the actress wants her estranged husband to return are a Mercedez Benz car CLR 500 valued at N3.5 million, a Volkswagen Passat 2.0 car, with registration number, DP 182 GGE, valued at N3.5 million and a laptop computer valued at N150,000. The rest, according to Okereke, are kitchen utensils, including a gas cooker, refrigerators, microwave oven pots et cetera valued at N600,000, three pet dogs, household furniture and appliances. The husband, however, appears to still have a place for the beautiful actress in his heart. He has asked the court to dismiss the petition and hold that the marriage being sought to be dissolved was validly contracted.